Hello and welcome to my Floral Friday series. 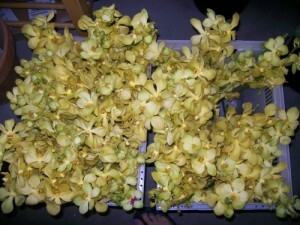 This week and several weeks to follow I will be talking about orchids. I am going to keep it simple and only talk about the common orchids that we use in the fresh cut floral industry because there are endless amounts of orchid species to talk about. Today I am focusing on one of my favorites- the Mokara orchid. The Mokara orchid comes on a stalk about 12 inches long, it can be used as is or it’s flowers can be picked and individually wired for boutinneres or as an accent to an arrangement. I would say that the average size of an individual Mokara bloom is about 1 1/2 inches. 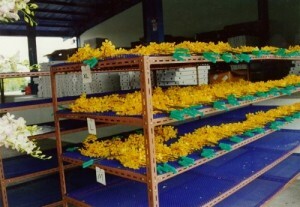 One of the best places for me to get my wholesale orchids are from a national company called Mayesh. It’s important in the business of flowers to build great relationships with your wholesalers and one great relationship I have built is with Sue Wood from their Phoenix, AZ location- talk about a wealth of knowledge! On all things floral, just ask Sue. So today I had a talk with Sue about Mokara orchids, here’s what she had to say about color variety, “mokara orchids come in orange, yellow, gold, purple, shades of red, white (has purple polka dots) and pink. But let me elaborate on pink, it’s not really a true pink, it has a strong purple hue to it so you almost have to call it lavender. The variety “Calipso” would be the closest thing to a hot pink you can find.” I have ordered Calipso as a hot pink before and Sue was right, it was more purple then pink. So this is when the handy dandy floral spray comes in- something I will talk about in another post. They are then graded by length and size. 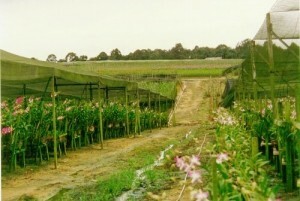 Sue told me that the largest exporters of Mokara orchids are Thialand, Singapore and Thaiwan and two of her growers are Amy’s Orchids and Talk Taiwan Orchids. 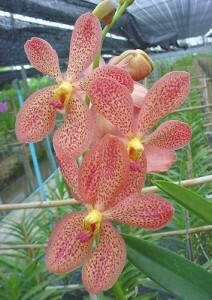 Talk Taiwan Orchids has some really interesting and unusual varieties that are bi-color. 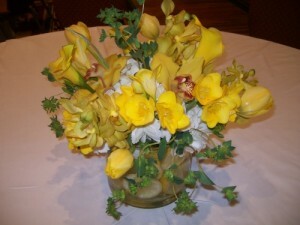 Here is a true yellow variety that I used for a wedding at the beginning of April, it’s called “Full Moon”. One thing to mention also, these orchids were not put in the cooler and sat in my studio for 4 days at about 72 degrees and were so happy and looked great. The cold cold temperature of my cooler is just too much for them and they could possibly freeze if left in there too long. Here they are in a beautiful mix of hydrangea, tulips, freesia, bluporum and cymbidium orchids. Please join me next week when I will be talking about cymbidium orchids.